Today’s joint show of the Porsche 919 Hybrid Evo alongside the 956 C on the German Nürburgring Nordschleife was the second stop of the ‘919 Tribute Tour’. Whereas at Spa-Francorchamps (BE) Neel Jani (CH) on April 9 beat the former Formula One lap record time, on this occasion Timo Bernhard (DE) and Hans-Joachim Stuck (DE) took it rather easy in the Eifel mountains. 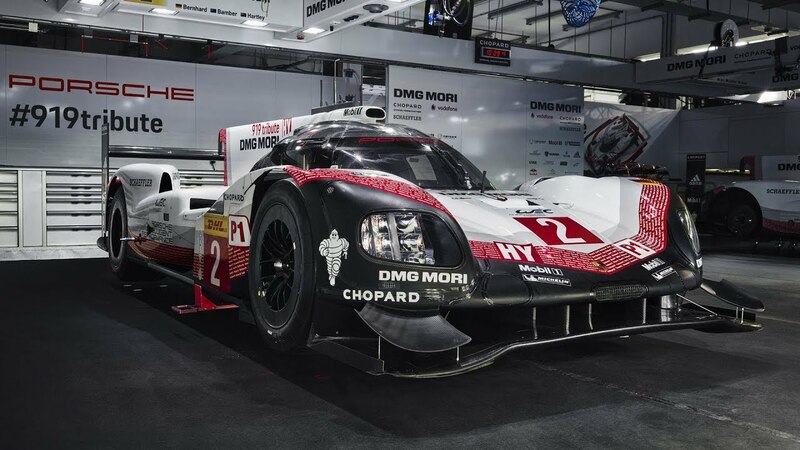 The 919 Hybrid – the Le Mans and FIA World Endurance Championship winning car of 2015, 2016 and 2017 – met the prototype that won all titles in the World Sportscar Championship from 1982 to 1984 and still holds the outright Nordschleife track record. The lap on the Nordschleife was the 919 Evo’s first public appearance. With the car that has been liberated from the restrictions that came from the championship regulations, Porsche recently established a new track record at Spa-Francorchamps. On April 9 2018, Porsche works driver Neel Jani (CH) lapped the 7.004 kilometre long Belgian circuit in 1:41.770 minutes. He was faster than any Formula One car ever, beating the previous record by 0.783 seconds set by Lewis Hamilton (GB) at the wheel of a Mercedes F1 W07 Hybrid, securing him pole position for last year’s Grand Prix. At the Nordschleife, the second stop of the ‘919 Tribute Tour’, however, no stopwatches were required as the two racing cars were driving behind a safety car and bypassed the start-and-finish section because of the grid formation for the 24-hour race. On his way to his 1984 Driver’s World Endurance Championship title, Stefan Bellof once shared a 956 with German Hans-Joachim Stuck. Despite an incident by Stuck that required repairs, the couple won the Imola 1000-kilometre race. Among Stuck’s many successes belong two Le Mans overall victories in 1986 and 1987, driving the successor to the 956, the 962 C. The Nürburgring 24-Hours he won three times when driving for BMW. The 956 C that Stuck now takes for a lap around the Nürburgring carries chassis number 005. It is the car Jacky Ickx (BE) and Jochen Mass (DE) shared during the entire 1984 world championship season. For commercial rights reasons the name of tobacco sponsor Rothmans frequently had to be replaced by the word ‘Racing’. This was the case on Bellof’s record lap chassis 007 and is the same at the car that Stuck drives on May 12. Just like the 956, the Porsche 919 Hybrid was the most innovative racing car of its time. The class 1 Le Mans Prototype, successfully entered in the FIA WEC from 2014 until the end of 2017, is powered by a compact two-litre turbocharged V4-cylinder engine and two different energy recovery systems. One transforms brake energy from the front axle into electricity. The second system generates electric energy from the exhaust where the gases accelerate a turbine up to 130,000 revs per minute. The electrical energy is temporarily stored in a liquid-cooled lithium ion battery. The combustion engine drives the rear axle while the electro motor boosts the front axle to accelerate the car with four-wheel drive while recuperating again energy from the exhaust system. To prepare the 919 Evo record car, the base was the 2017 world championship winning car. Its entire hardware of the power train remained untouched. On top came developments that were prepared for the 2018 WEC but never raced after the end of 2017 withdrawal. Additionally, several aerodynamic modifications were made. An evo version of the Le Mans winning Porsche 919 Hybrid established a new track record at Spa-Francorchamps. The engineers of the 956 made the Porsche into one of the most successful racing cars of all time. Limit: the point at which it’s not possible to go farther. Scenes from previous years of Porsche Motorsports.